TV Installation services have become a very popular enhancement to commercial and residential areas. While spending time at home, most of us keep the TV on all day, even if it is only for background noise. Business owners find it in their best interest to install flat screen TVs so their customers spend more money and stay longer. 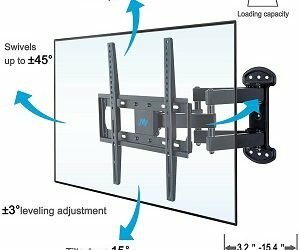 Wall mounted TVs help customers get comfortable and not miss their own TV at home. 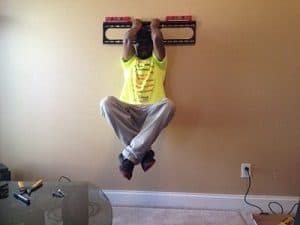 When it comes to choosing a professional installer for your home theater system or wiring up a complete home theater system for your man-cave, you can trust us to complete your TV mounting job promptly and professionally. 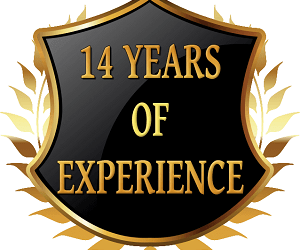 We go the extra mile to provide you with peace of mind and results that speak for themselves. 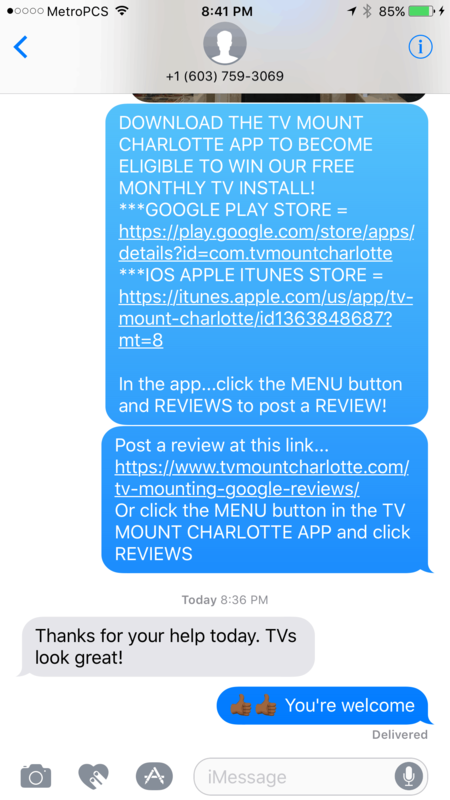 We have provide flat screen TV mounting services for the Charlotte area for more than a decade and are proud of our commitment to service and outstanding reputation. We have amazing 5-star reviews online. 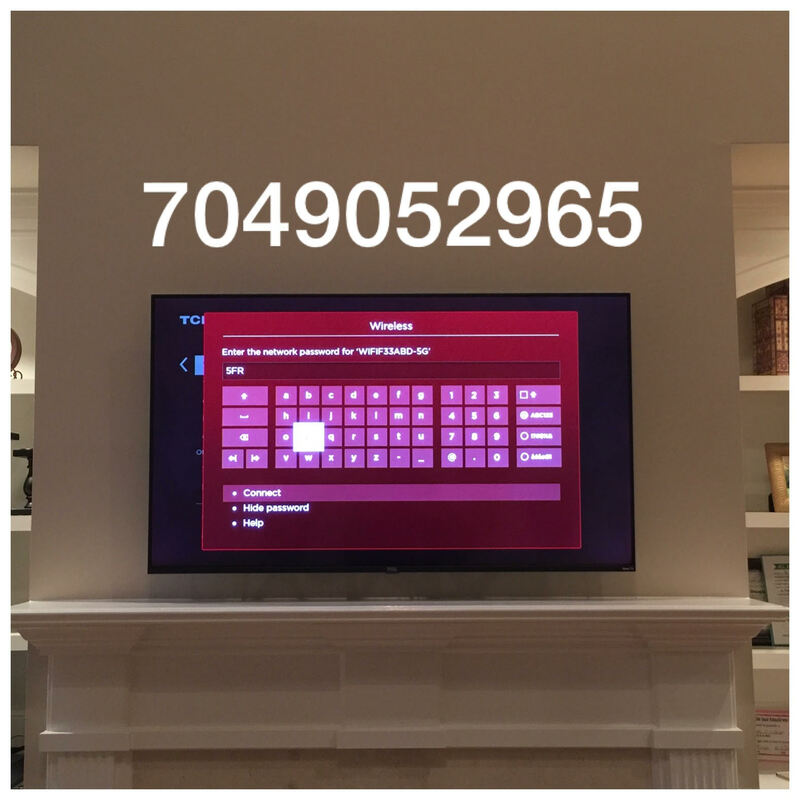 Whether you are looking for same/next day TV installation or just looking for a quote for a future project, we have you covered. 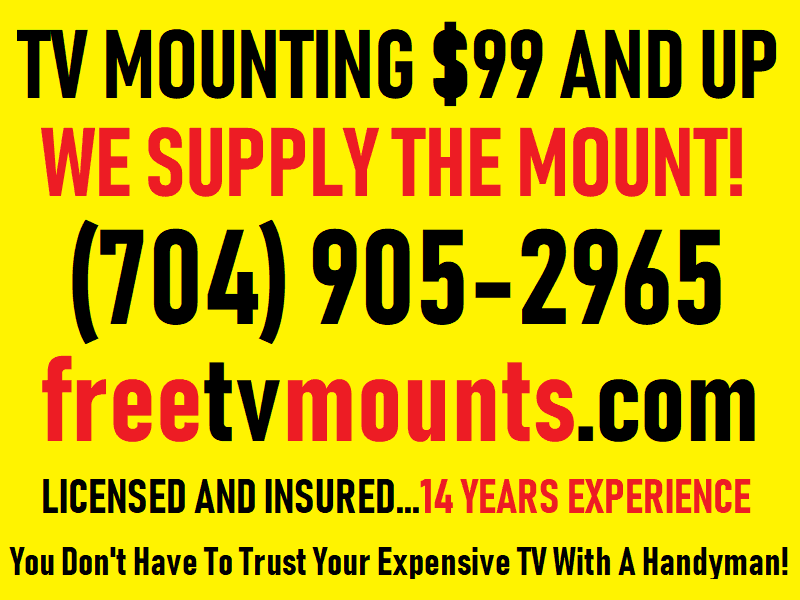 We offer multiple TV discounts if you have more than one TV that needs to be mounted. Moving day can be a stress on you, especially with relocating and reinstalling your TVs and home theater devices. Most movers are not TV-friendly so we are here to help. 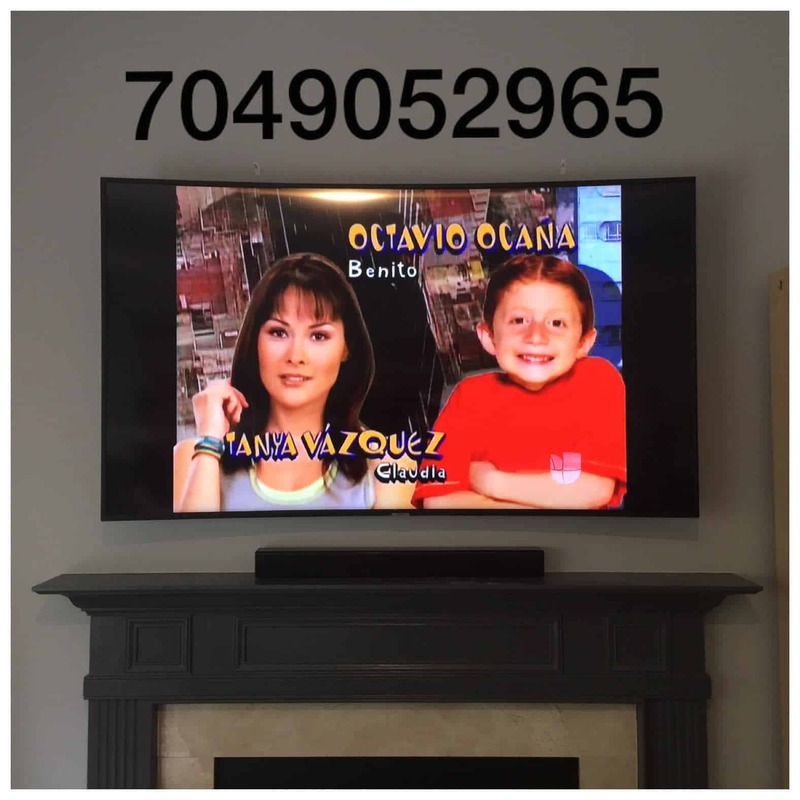 To compliment our exclusive residential TV installation services, we offer TV un-mounting, TV wrapping, and TV re-mounting services in the Charlotte area. 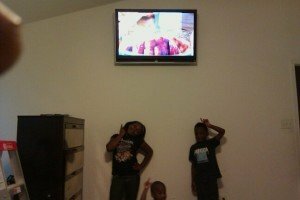 We will remove your TVs and wall mounts from the wall and wrap them with thick blankets to protect them while you or the movers safely transport them to the new location. Once the TVs are at your new home, we will unwrap and re-mount your TV at your desired location. In most situations, we can schedule TV un-mounting, wrapping, and re-mounting the very same day! Contact us today to discuss options, get a quote and schedule! Our professional services may not be the cheapest in the Charlotte, NC area, but we believe that you get what you pay for. Hanging TVs has been our thing for over a decade and we take it very serious. 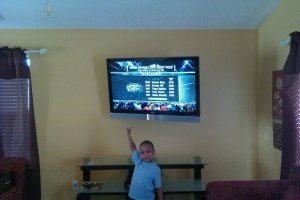 It is far more to a custom TV install than just drilling 4 bolts into the wall and hanging the TV. 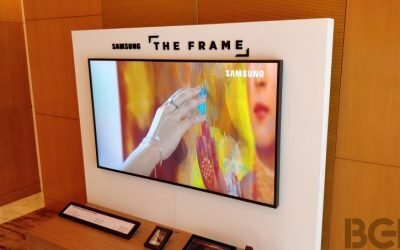 Why Hire A TV Installation Service In The First Place? If you hired a TV installer simply to get your TV off the floor, it should be easy to accomplish your goal with the average handyman. But if you want to make sure your TV installation is safe and comes with a no-fall guarantee to ensure the safety of your family and pets, you need to consider a professional TV installer. For only a fraction more of the cost, you can rest assured that your TV will be installed to specs with no faulty wiring issues or problems with the TV mount being secure. 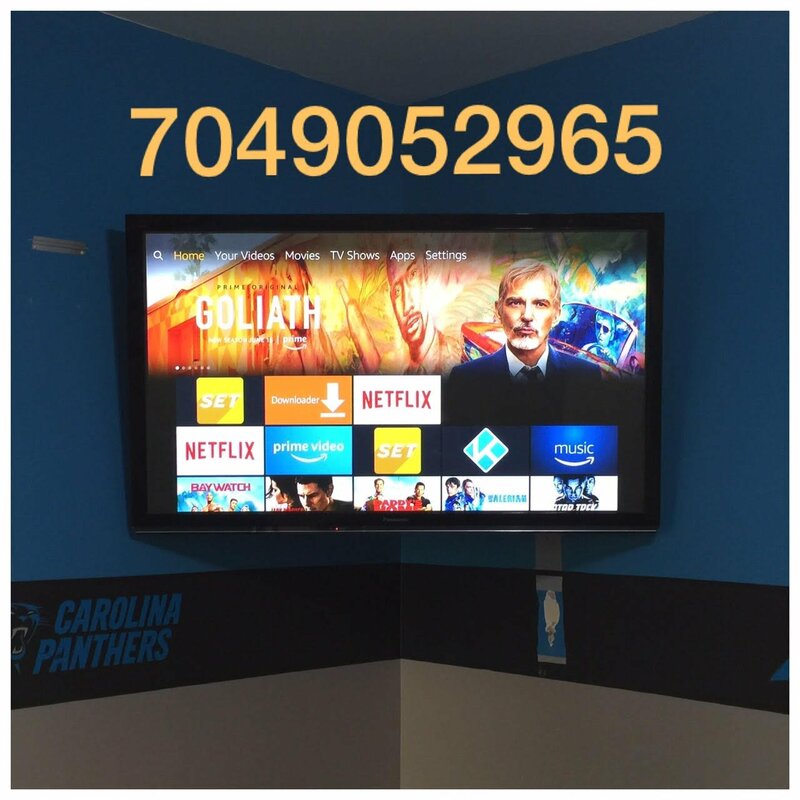 We are Charlotte’s top choice in TV wall mounting and have even installed TVs in over a thousand of your favorite commercial locations in the Charlotte area, like The Nascar Hall Of Fame, Sprint, Subway, Wing Stop, Hardees’, and Charlotte Mecklenburg Police Department headquarters. 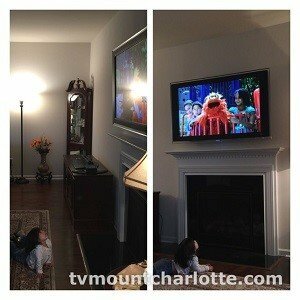 We treat every installation the same and make sure your kids or pets can safely sit right under the TV anytime they want to.